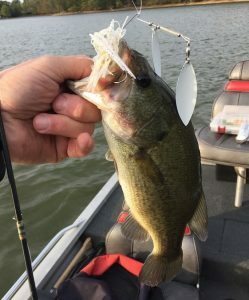 As noted, the bass in today’s pic came from Lake Storey and was the result of breaking a blade off of a Terminator spinnerbait on the second bass of the morning. Enter an old fishing friend, The Blue Glimmer, and a half hour later I had the first catch on the bait in nearly ten years. Why the lengthy hiatus? Not really sure but likely due to the fact that the model went out of production and I only had a couple spares. And wouldn’t you know, the triumphant return was short lived. After a strong Lake Storey showing with seven bass I busted a blade off this one the very next outing.